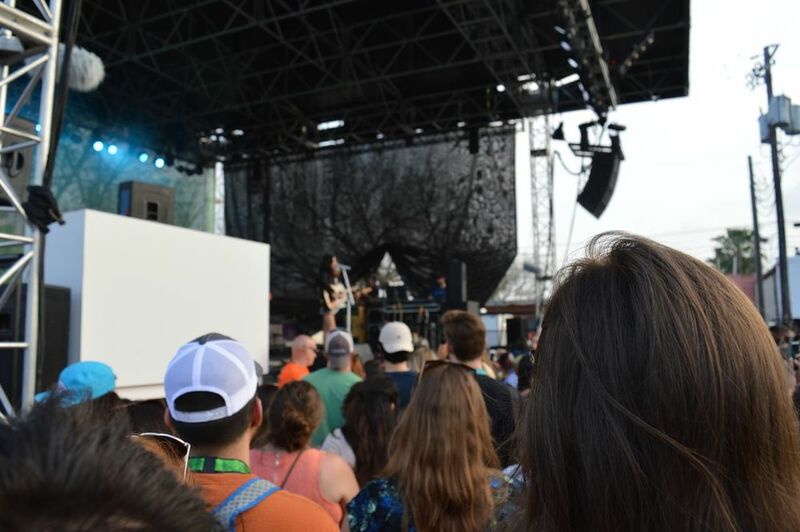 In my Tuesday recap, I noted that the vibes in Austin were shifting as the Interactive segment of the festival segued into the Music portion of the festivities. If Tuesday represented a gradual transition, Wednesday was confirmation that SXSW was now completely different: sweatier, rowdier, and much more crowded (dare I say, crowdier?). Streets from Nueces to Chicon were flooded from breakfast to Fourth Meal with out-of-town musicians, demo-wielding MCs, sneaky chillums and less-sneaky blunts, coozied Budweiser tallboys, and an insane amount of police officers and security guards. The temperature may have fallen to a more reasonable level than Monday and Tuesday, but the sheer density of people roving from venue to venue on bikes, scooters, pedicabs, and on foot, made Austin feel like it was ready to boil over. But before descending into the chaos of the hundred or so showcases, I had the opportunity to attend the keynote conversation at the Convention Center with Michelle Obama. FLOTUS was joined by panelists Sofia Bush, Diane Warren, and Missy Elliot, as well as moderator Queen Latifah. The group was discussing the #LetGirlsLearn initiative, which strives to make it easier for young women around the world to receive an education and reach their true potential. And since this is SXSW, the group also discussed musical influences, with a consensus that Stevie Wonder was huge in terms of empowering these strong women at a young age, as well as the need to make sure women's voices are heard not only in boardrooms and classrooms, but in recording booths as well. After being held by Secret Service for a few minutes post-Obama chat (trust me, it's a much less interesting story than it sounds), I went across the street to catch up with Kevin Garrett. Kevin is an amazing artist and incredibly authentic dude who we profiled on Slant way back when he was playing buzzed-about shows at CMJ in October. Since then, he's been perpetually on the road, touring with X Ambassadors and Alessia Cara. After yet another long walk across town to Spotify House, I escaped the heat by ducking into Gelateria Gemelli on E 6th for an iced coffee and some free wi-fi to write about Diet Cig. Cooled down and charged up by the extra caffeine, I walked over to catch one of my new favorite bands, Joseph. Their set was packed, but still comfortable thanks to the shade of backyard-style stage. The last time I saw Joseph, it was in NYC for CMJ, and it was just three sisters singing with a guitar, kick drum, and tambourine. This show featured a full band, and as they mentioned in their recent Slant interview, the dynamic of the show had totally evolved. I was blown away the first time I saw Joseph perform, but now, with much higher highs and lower lows, I was moved. They played favorites like "Honest" and "Cloudline," as well as newer cuts off their upcoming album. Keeping the sibling theme rolling, I bopped outside to the big stage to check out Jesse y Joy, a brother and sister duo from Mexico City with a crazy loyal fanbase. People were psyched for Jesse y Joy. One of the cooler discoveries I've made during SXSW, even though I felt like the only person in the crowd who wasn't familiar with their music. After that, it was back to the smaller stage to check out the soulful vibes of John Moreland. I had the pleasure of getting to see Rayland Baxter perform for a second time while at SXSW after a mind-blowing set at Antone's a few nights prior. While the setlist was similar, their was a different energy to the show, trading the tight, late-night vibes from that first show for the bigger, warmer outdoor stage. Baxter and his bandmates laid the jams on thick, and had the crowd singing along to "Yellow Eyes" and banging their heads to scorching instrumental solos. And then it was time for the new Queen of Country Music, Kacey Musgraves. Musgraves, clad in a black long-sleeved dress with a blinged-out mic stand, was back in her home state of Texas and clearly loving it. The crowd sang along gamely to hits like "Late to the Party" and "Merry Go Round," as well as a chilled out interlude featuring Bob Marley's "Three Little Birds." And then (bum Bum BUM) ... came the lines. With approximately eight gajillion people squeezed into a finite area of live venues, not to mention blocked off streets, lines for late-night sets started growing before the sun had even set. I personally made the mistake of waiting in line for the YouTube venue, which featured Santigold (who I caught and was dope) and Future (who I wanted to catch, but didn't want to watch him from half a mile away behind drunk, irritated people who just spent way too much in a snakey, confusing line). I bailed on Future, leaving Harvey to witness Future Hendrix in all his Dirty Sprite glory. Future during March Madness. DAMN WHY DID I LEAVE THAT SHOW??? Ah, but now I remember: I left that show so I could go get a great spot for the immortal, eternal, untouchable Erykah Badu. I wandered over to Mohawk, averting my eyes from the numerous lines that seemed to pop up around every corner. I joined a (decidedly smaller) line to get into Mohawk, and once I was inside, I was treated to a funky-as-hell set from Neon Indian. Alan Palomo certainly warmed up the crowd for Badu, and past the witching hour, the Queen herself emerged for a dazzling, yet brief set. After her stellar live band played about 10 minutes of jammed-out neo-soul (some of which shouted out J Dilla), Badu stepped out, with such presence and command, that everyone was enthralled for the rest of her set. For anyone who's never seen Erykah Badu live (like me until last night), she's a legend. She was here, in all her glory, and then the next moment, gone. The Mohawk crew (thanks to a noise ordinance) cut the sound on her set, leaving Badu transparently confused ("You're doing this to Erykah Badu?" you could see her, and the entire audience, thinking). But gracefully, Badu took a final bow, exited the stage, and effectively blew the minds of everyone in attendance. Leaving Mohawk, it felt like a weight was lifted, even if there was considerable pain in my shins and heels. But all that pain from walking around and standing in lines was completely worth it by Wednesday's end.